Interested in being a GPS Mentor for the 2018-2019 school year? Apply here! GPS (Guidance - Perspective - Support) is a tool for LGBTQ and similarly-identified students to utilize as they are navigating their understanding of their identities. 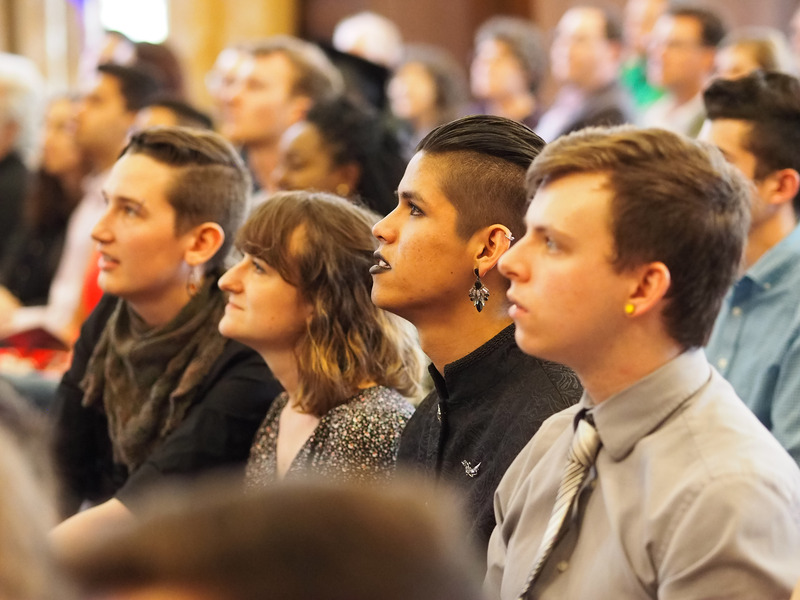 The GPS Program provides students with Guidance toward helpful information and resources, Perspective of a fellow student who has experience with coming out, and Support around their identity development. 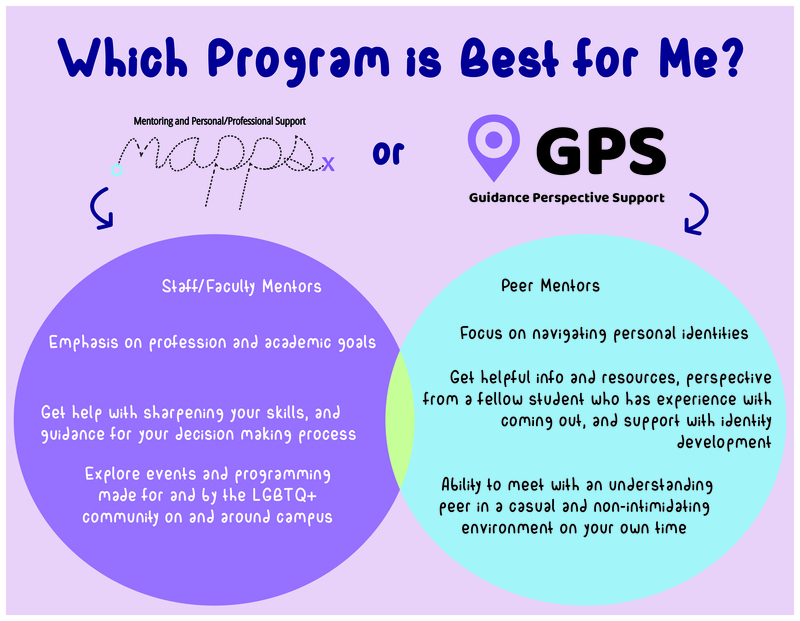 Note: The GPS Program is not intended to take the place of professional counseling, but rather to be a supplemental or alternative option for students seeking peer mentorship. Start by filling out a confidential online request form. From there, the GPS Coordinators will match the requestor with a trained GPS mentor. The requestor and GPS mentor can then quickly arrange a place and time to meet that works for both of them, including evenings and weekends. Students who meet with a GPS mentor are also asked to complete a confidential survey so that we can continually assess and improve the program. Note: At this time, this program is only available for University of Michigan undergraduate and graduate students. Fill out our volunteer interest form, and a staff member will connect with you. Once accepted as a mentor, you'll go through a training process to better prepare you for being a GPS mentor. Note: Because mentor-mentee matches are made based on detailed information, provided by both mentors and mentees, you may not be paired with a mentee right away. Who is GPS best suited for? What are particular features of this program that make it helpful? Students can relate to each other in a way that staff/faculty and non-students simply cannot. Research also shows that peer support programs are highly effective. A major contributing factor to depression or anxiety for an LGBT person struggling with coming out is a feeling of isolation. This is particularly true for LGBT people of color, people of faith, and those in traditionally less-welcoming communities such as Athletics, Greek Life, and some STEM fields. With the GPS program, we have the ability to pair a student with another student who has come out in similar circumstances, thereby providing an increase in support and understanding and a decrease in feelings of isolation. Unlike support groups which require a consistent time commitment, the GPS Program is highly flexible and can be started at any time during the school year. Once a GPS requestor is paired with a GPS mentor, they can quickly arrange a place and time to meet that works for both of them, including evenings and weekends. The pair can meet as often as needed for as long as desired based on the needs and availability of each person. This could mean they only meet once, or it could mean that they meet weekly for a whole semester. Students who are closeted or who are uncomfortable with their sexual orientation or gender identity may find the prospect of entering the Spectrum Center or attending an LGBT student group meeting to be too risky or intimidating. Some may fear being seen by others and being identified as LGBT, some may not be ready to be around a group of LGBT people, and some just might not be able to make it to the Center during office hours. The GPS Program gives these students the ability to meet with an understanding peer in a casual and non-intimidating environment and at a time that is convenient for them. Other questions? Contact our Assistant Director for Learning and Development at romanchr@umich.edu or call the office at 763-4186.